Residents of Montgomery County, Maryland, and surrounding areas are being urged to get a flu shot this fall to help them stay healthy and avoid seasonal influenza, an illness that affects more than 25 million people in the United States each year. Health officials from Shady Grove Adventist Hospital in Rockville, Md. ; Washington Adventist Hospital (WAH) in Takoma Park, Md. ; and Montgomery County government have partnered with local organizations on a new campaign called “Take Your Shot for Health,” which launched recently during a news conference and flu shot clinic at Shady Grove. Seasonal influenza, or “the flu,” results in about 150,000 hospitalizations and 36,000 deaths annually. In order to increase flu shot participation this year, Adventist HealthCare, its local nursing homes and its two local hospitals, are partnering with the Montgomery County Department of Health and Human Services, the Washington Wizards, M&T Bank, and WTOP radio to educate the community about the importance of flu shots and to increase participation in these annual vaccinations. The Take Your Shot for Health campaign will work to provide 15,000 flu shots to the community this fall. Anyone with chronic heart, lung, or kidney conditions; diabetes; or a weakened immune system. 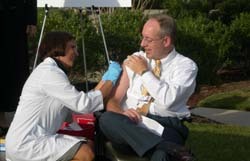 To learn more about Take Your Shot for Health, visit www.takeyourflushot.com. 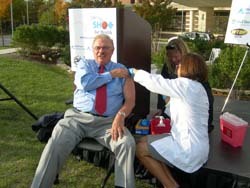 During the press conference and opening day of the campaign, Neville Harcombe, executive secretary for the Columbia Union Conference, receives his flu shot from Shady Grove Adventist Hospital's infection control nurse, Michael Anne Preas.